We would like to talk about some of the practices that have been lately adopted by Muslims in the domain of politics and that deviate from the course of justice that is asserted by the Holy Ayah which says: “No soul burdened with sin can carry the burden of another.” (17:15). It has recently become a common practice to abduct an innocent human being or detain him, just because someone who belongs to the religious sect or political party of the abducted had abducted someone who belongs to the sect of the abductor. It has also become common to hijack a plane, detain its passengers, threaten to kill them or actually kill them, just because the country which owns the plane has detained some of the abductor’s friends or partisans or because it exerts some pressure on a certain political power, or just for declaring a certain political or humanistic stand, whether general or specific. This has become an adopted political method and a means of exerting pressures. It has even become a distinguished feature of Islamic political action, as a result of the propaganda of the counter-media that talks about "religious terrorism". But we want to study the issue from the viewpoint of justice in Islam that is explained by the above mentioned Ayah, in order to emphasize the necessity of making any Islamic political action go hand in hand with the Islamic ethics. 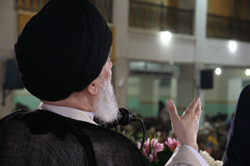 In this respect, some might see in this method (abduction) many positive practical elements in favor of the Islamic action against injustice arrogance and unbelief, in the course of confronting the tough pressures of the arrogant and the oppressors against the downtrodden Muslims or other peoples. As Muslims do not possess the power that the arrogant do, they have to face them by their elements of strength which are, at the same time, elements of weakness from the viewpoint of the arrogant. Therefore, this conforms to the juristic rational rule which states that the greater interest surpasses the lesser harm, which means that the juristic ruling of unlawfulness could be annulled by the juristic rule that deems the same thing lawful when there exists a bigger interest, as in the example of permitting to kill Muslim prisoners if the infidels use them as shields to prevent the Muslims from achieving victory. This practice, then, would become lawful from the Shariah point of view. We do not deny that certain positive results can come out from this practice, yet those are to be weighed and compared with the negative results, such as leaving a negative impression on the level of the Islamic call, since it distorts the image of Islam. It might also lead to negative reactions against Muslims in other places. Thus, one ought to make a comparison between the negative points and the positive ones and not resort to this method except in extremely difficult cases, in which all other means to fight political persecution are unavailable. When we resort to this means, we should be absolutely cautious and careful not to resort to such means except when it is absolutely necessary; i.e. when anything else is of a lesser significance; thus, it should not become a political practical method adopted by Muslims.